Are you looking for a unique homemade gift idea for Valentine’s Day? 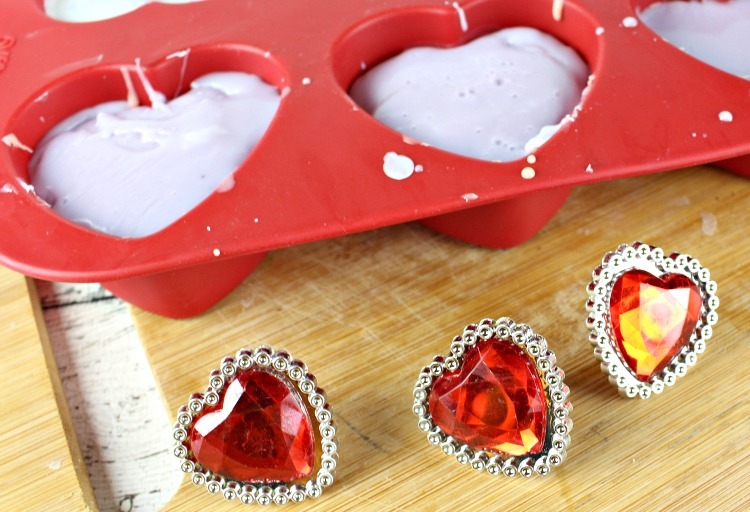 These DIY Ring Bling Soap Bars are super fun for kids and can be made in just a few minutes! 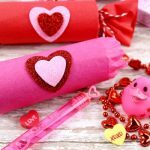 Valentine’s Day is just around the corner, and you’re probably starting to look for some cute homemade gift ideas! If you’re as tired of the traditional candy that is handed out among school-aged kids as I am, consider giving homemade Ring Bling Soap Bars as gifts this year! All you need are a few simple supplies and you can literally make these adorable DIY gifts in minutes! It’s better and easier than battling the crowds at stores to find kid-friendly Valentine’s gifts! While all of the little girls in your child’s class will go crazy over these Ring Bling Soap Bars, the little boys may not. You could stick another toy in half of the soap bars for the boys too. Things like ninja figures, toy trucks or these adorable mini fidget spinners would make a good choice! This recipe will make 6 Ring Bling Soap Bars, so simply multiply the ingredients by the number of people you want to make soap bars for and you’re all set! Most melt and pour soap bases come in a large block with 1 ounce cubes that can be cut/broken apart. Separate 20 of the cubes from the block of soap base. 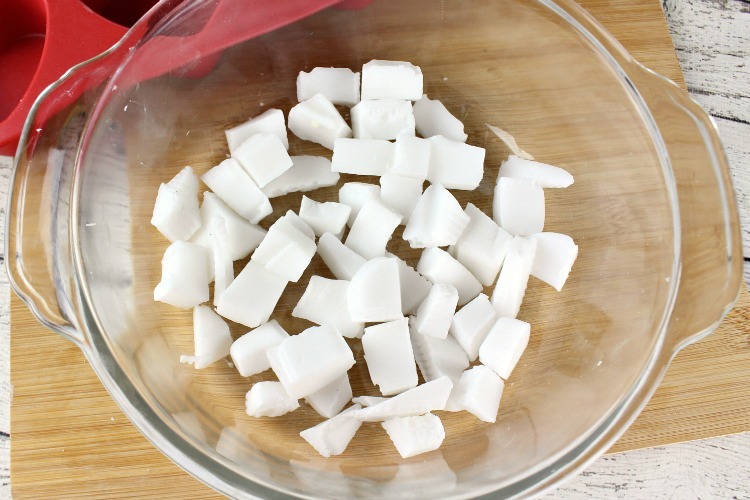 Chop or grate the soap cubes into smaller pieces and place half them in a double boiler over medium heat. Stir frequently until the soap is completely melted. 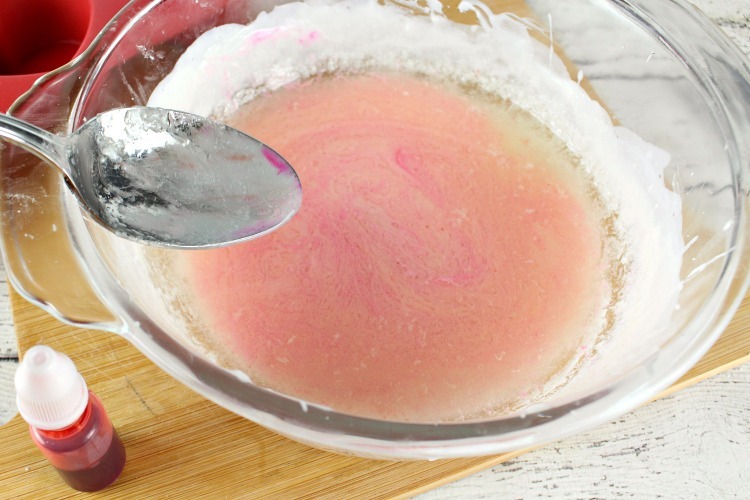 Add 2-3 drops of Vitamin E oil, the strawberry fragrance oil and a few drops of the red or pink soap colorant to the melted soap and whisk to combine. 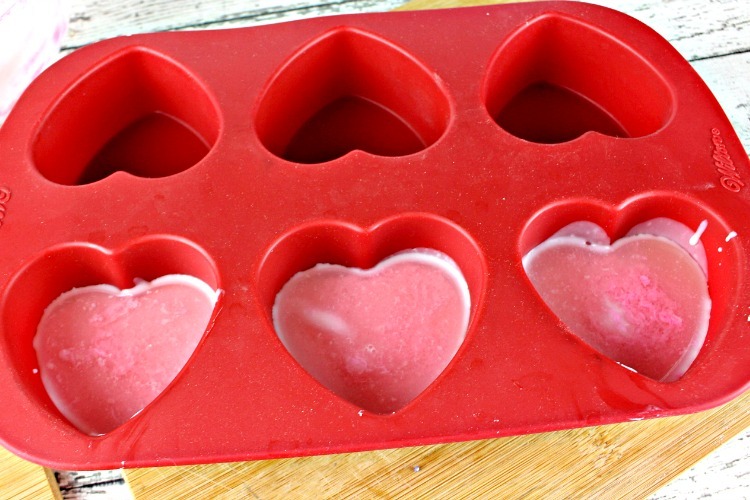 Immediately, pour the melted “pink” soap into the heart-shaped molds, filling each mold only half way. It will harden within 2 minutes of pouring into the molds. If the soap hardens too fast, just place the double boiler back on the stove for a minute. Add the other half of the soap cubes to your double boiler, and heat over medium until the soap is completely melted. 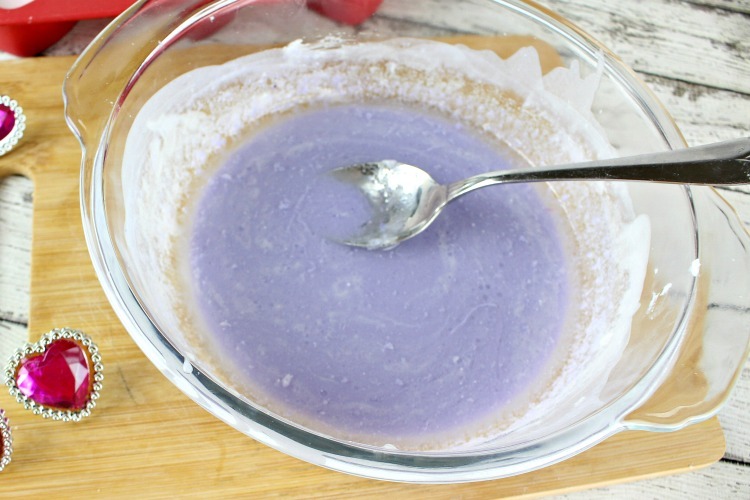 Add 2-3 drops of vitamin E oil, the bubblegum flavoring oil and lilac soap colorant and stir well to combine. Be sure to stir really good or some of the soap that settles to the top will remain white in color. It will just give your soap a 3 layer look like mine if you don’t mix well enough. Pour into each heart mold and fill up to the top. 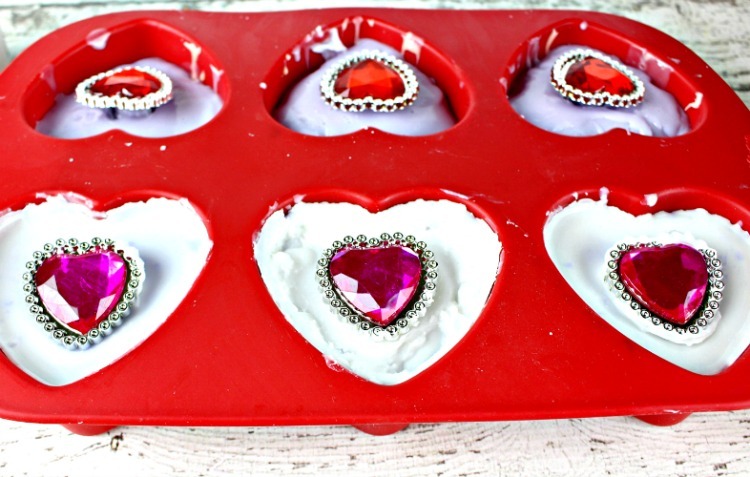 Wait 1 minute before gently placing a toy ring into the middle of each soap mold. The soap should be firm but not completely hardened. Place the silicone mold in the refrigerator and chill for 1 hour. 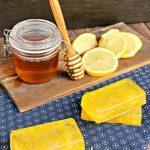 Remove the soap bars from their molds and place in an airtight container for storage up to 6 months or place in organza bags or a mason jar for gifting. 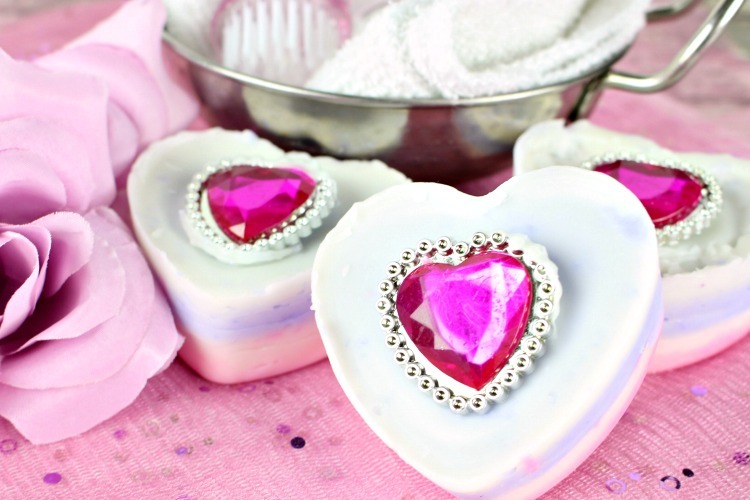 Let us know how your little girls loved these bling soap bars! Pin this post to your DIY Beauty or Valentine’s Day boards! Those soap bars are so pretty! These Ring Bling Soap Bars are adorable. They would make great gifts for teens or little girls. Even better, great Spa Day gift idea too. What a fun idea! Thanks for sharing with Party in Your PJs! cute idea! Thanks for joining the To Grandma’s House We Go link party! Hope to see you next week. So fun! Thanks for sharing with SYC. I’m sure it’s not intentional, but I’m not seeing a link back to the party. This is such a clever idea for little gifts for Valentines!! And thank you for sharing your blog with us on Oh My Heartsie Girls WW, and a surprise, your story is being featured this week, Pinned and shared on Instagram!! My morning goal, check! Hope you will stop by each week to share again! !